MedAir®, Inc. provides leading-edge Air Purification Systems that are specifically designed for Negative and Positive Pressure Isolation Rooms and the control of airborne pathogens, such as Tuberculosis. The MedAir® Source Capture Series is designed to create Negative Pressure Isolation Rooms meeting all federal and state requirements. The MedAir® Air Purification Systems stand apart from others in design, performance, noise level, reliability and patented Source Capture capabilities. Our MedAir® Systems are designed with our patented Source Capture capability. This innovative design captures infectious viruses and bacteria in the air zone around the infected patient�s head. As the patient breathes, air is re-directed backward, captured by the MedAir® System, irradiated by a safely concealed UV germicidal lamp and then drawn through a HEPA-Plus filter before being exhausted from the room. In addition, the MedAir® System provides at least 12 air changes per hour on low speed and approximately 18 air changes per hour on high speed. The MedAir® Isolation Room Management System allows for remote control and monitoring of the Isolation Room. It includes a TSI PresSura® 8630 room pressure monitor that displays the actual room pressure differential, a key lock switch for ON/OFF and dual speed control, visual and audible alarms, and an elapsed time meter for scheduling filter and UV lamp changes. 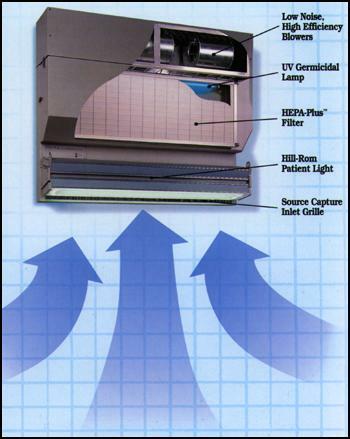 HEPA-Plus Filtration offers filter efficiency of approximately 100 times that recommended by CDC. The filters have been tested down to .02 and are rated at 99.9995% at .12. The large surface area allows for low maintenance and low noise levels. Safely concealed UV Germicidal Lamp provides constant irradiation of both the incoming contaminated air and the surface of the filter. Patented Source Capture Technology redirects the airflow away from the healthcare worker, past the patient, into the source capture inlet grille of the wall-mounted MedAir®B> System. 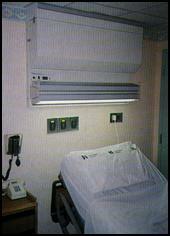 Fast, low-cost installation that can easily be integrated into existing HVAC systems and avoid costly reconstruction. A typical system can be installed in less than one day. Capture and containment of airborne pathogens. Creation of certified Negative Pressure Isolation Rooms. 12+ air changes per hour. Redirected airflow safely away from healthcare staff.